I often look back at my travels and try to recall the moments that have changed something in me, helped me overcome my deepest insecurities, accept the realities and made me stronger. Taking my ninth trip (the longest one) this the year I wanted it to be special so I decided it would be without friends, without family. I wanted to figure out who I am when no is looking. Do I need to change? The answer was yes indeed. I needed to re-evaluate my priorities and goals in life. Do you see? I just got carried away and spoke about a whole bunch of lies I just made up. No one agreed to come along because of their corporate jobs, landslides, rains, homesickness, maid didn’t turn up… I had their good wishes anyways. 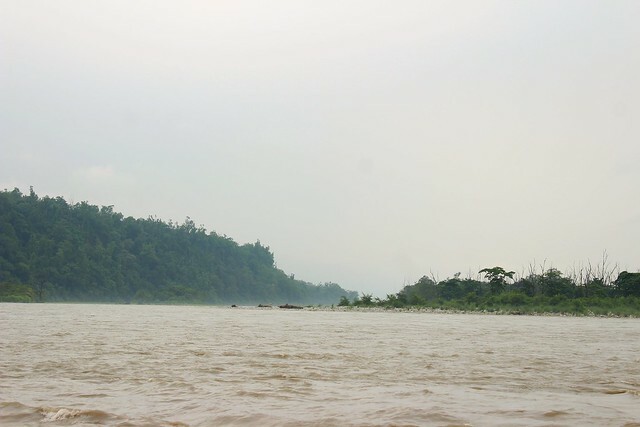 On July 21st midnight I took an HRTC bus from New Delhi ISBT to Rishikesh, unaware that it will be my comfortable most journey for the rest of the travel. The bus arrived at Haridwar at about 4:30am but had to take the bypass route due to the Kavad Yatra. 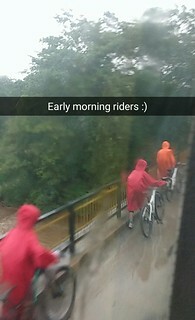 It was downpouring heavily and Ganga was flowing furiously but I was greeted by more than fifty student bikers who were probably riding to Rishikesh. It took another hour and a half for me to reach Rishikesh. The realization with this holy city is that, its a kind of India you want India to be a lot of time. A city filled with life, easy, good life. [s] Kevads smoking Chillum at Six in the morning was the first thing I saw upon arriving, I wanted to have one but then I remembered I don’t smoke. 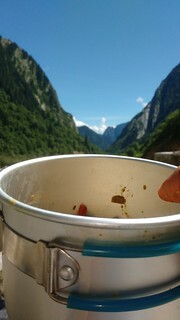 I arrived at basecamp at 6:30am and was soon served with hot delicious breakfast. Being a little introvert I was insecure about how I will mix with other people and I became extremely conscious on the first day, didn’t talk much and as a result, I acted weirdly. 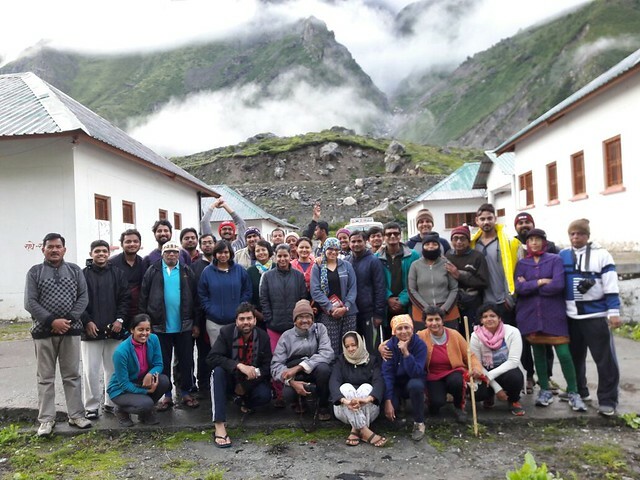 The interaction session was fun, much friendly in fact, and we chose Dharmesh Ji as our group leader who seconded our decision for the rest of the trek. We were warned about the bad weather conditions and how the previous batch was delayed due to landslides. We were supposed to leave by Five next day. It continued to rain all night. To our surprise, almost everyone (Jayesh you were an exception here) was awake by 4am and left on time with our packed lunch. I was amongst the backbenchers in the bus. Chanting Lord Shiva’s name our ten-hour long journey to Joshimath started. We had to cover a distance of 250 kilometers. Two hours of reckless ride and almost ten people in the bus were already suffering from motion sickness. Our journey halted at around 7am when a truck broke down blocking the way ahead. Moving out of the bus and taking a look outside it appeared as if the Dashrathanchal Parvat has cast a bewitching spell on everyone. Describing the journey after Deveprayag; if I looked outside, pelting stones from the hills evaporated away all my hope to survive and if I looked inside I had to watch those motion sick faces. I chose the former option and continued snap-saving the horror. All credits to the mighty bus driver we reached Joshimath as per our schedule. Our hyperexcited selves kept the luggage in the hotel and left for Auli. Little I had clue what was going to come next. 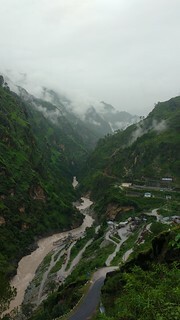 Auli was awe-inspiring. As we began to gain height in the ropeway the clouds cleared as if sucked by a vacuum. From the top, we could see Nanda Devi shining in its full glory. I was trying to be friendly and was taking candid photographs and talking about my school life. I heard a sudden precipitous reply from Devosmita, one of the fellow trekker, asking which school I was from. Turned out we were from the same city and the same school. Oh look, I can finally initiate a conversation; 10 points for Gryffindor. It wouldn’t have even been fifteen minutes that we realized we share the same college too. Guess the odds. 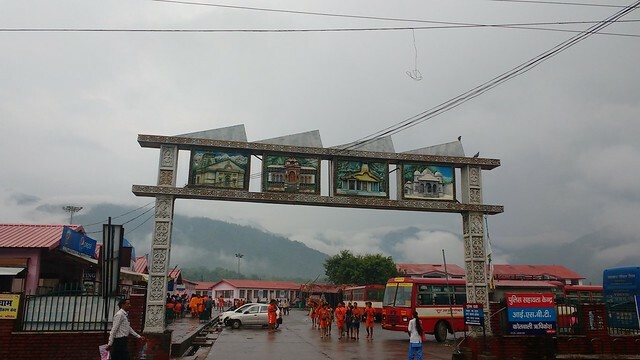 Kshitija, Siddesh, Devosmita and I wanted to visit the Shankaracharya Matha and the Narsinh Temple. 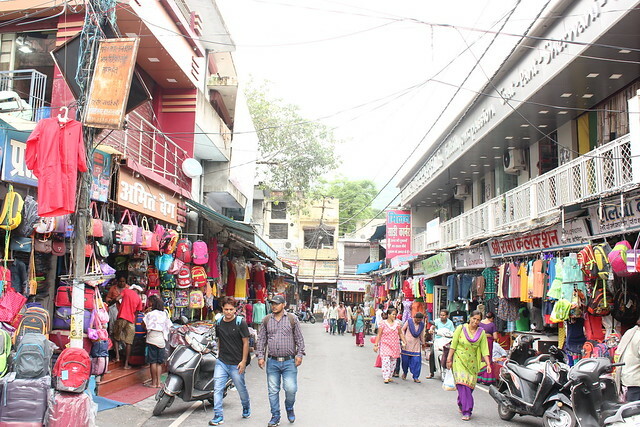 The path to the matha was from the main market area and after asking the way few times we were able to reach there. The matha was few steps away from Kalpavriksha and the cave where Adi Shankaracharya did his meditation. We were warmly greeted by the guru of the matha and he shared his wise words with us. He told us about how an earthquake completely destroyed Joshimath leaving just the Narsinh idol safe, the city was brought back to life when Indian Army constructed the roads. His words only increased our craving to visit the Narsinh temple. We began our descend but it was already 7:30pm and we were told to reach anyhow by Eight for the dinner. Our tiny brains calculated that we will reach on time if we hustle a bit. Every other person said we were ten minutes away and eventually those ten minutes never finished and we the so called explorers decided to go back. In the meantime, Devosmita did find time to grab a kid and kiss him/her, maybe I was with a pedo or just a random mountain kid kisser. Also, Siddesh feared dogs, the reason he might have forced us to not go further, I concluded. 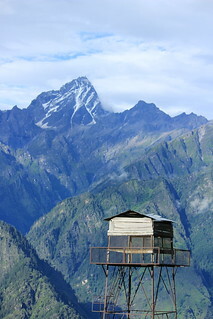 Anyways we left it as the first thing to visit when we would Joshimath again. 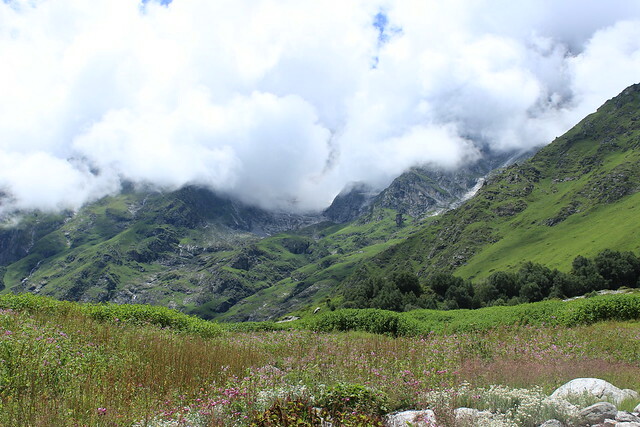 Next morning we were supposed to leave for Govindghat, from there we had to trek to the base camp at Ghangaria. 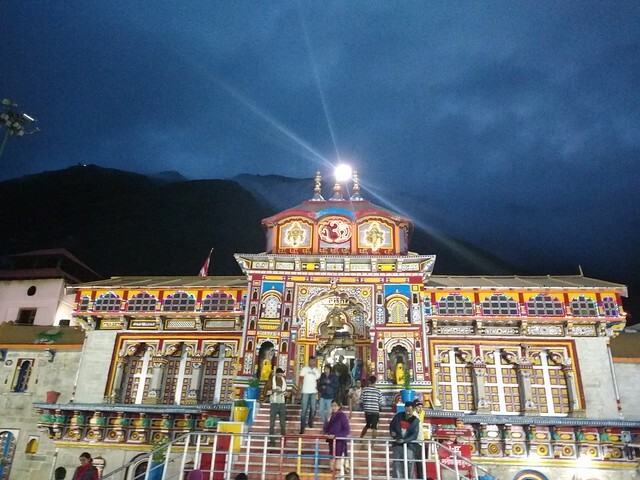 Govindghat marks the confluence of Alaknanda and Laxman Ganga and entry to the Valley of Flowers National Park. 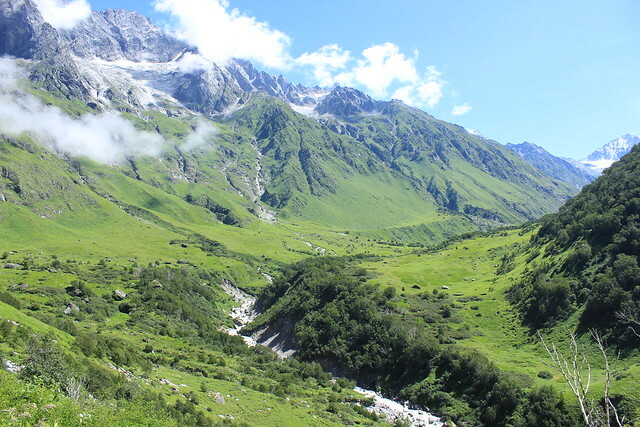 Trek to Ghangria village is a busy trail during July and August since the Valley and Hemkund Sahib Gurudwara is open from June to October and is covered by snow for the rest of the year. 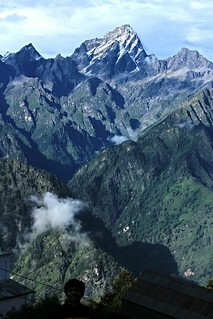 We had to cover a distance of 15 kilometers and reach an altitude of about 3,000m from Govindghat (about 1,800m). 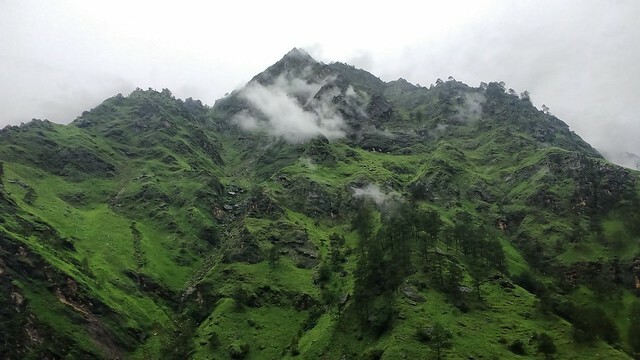 The trek is not too steep and the path is well maintained throughout. What makes it difficult is the luggage you’re carrying and the distance one has to cover to reach the village before sunset. Like the good old books teach us, I knew the journey was more important and Kunda, Shardula and Ankit made it memorable. From having deep conversations about Game of Thrones, sharing the hatred for Joffrey, mountain tales, food, art and religion we talked about everything. They were the kind of friends I would love to keep close by and never let them go. I was galloping like a horse and eventually I sat to rest for a few minutes, and as the old fable taught us, the first thing that struck me was that I am left behind. I waited for a few minutes, panicked a little then I decided to continue to walk. The first lesson I learned was not to trust the distance signboards. The gain in height of the trails was suddenly becoming directly proportional to the weight of my backpack and soon the only thing I cared was to reach basecamp in time. 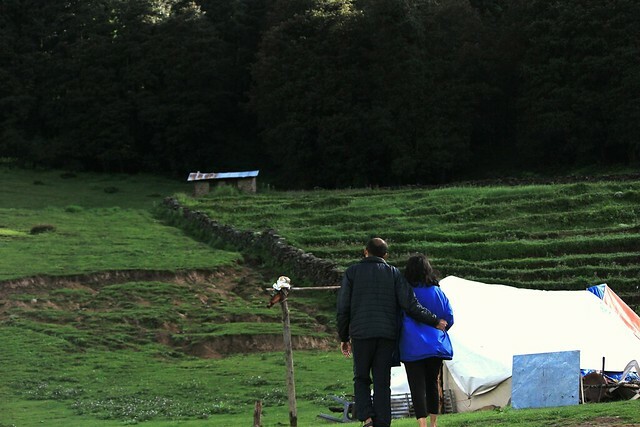 Covering the last mile changed me forever, soaking in the sunset at Ghangria, I walked upward through the winding roads and the broad valley with Laxman Ganga’s raging voice. I was welcomed by three little human chipmunks who literally robbed me with their cuteness, took away my chocolates and were going to be my smile-passers-by for the remaining days. I somehow managed to reach our base camp, Sri Nanda Lokpal Palace Hotel, with my already turned burdensome backpack at about 4:30 only to figure out I am the fourth one, Vidur and Kshitija being the first following Ritvik. I was just happy surviving the first day. I’ll be refraining myself from mentioning the ranks again as these guys trekked at inhuman pace and we let them have the honor. Yes, of course, I was hungry and ate like a cow wishing I have four stomachs. After supper, we had an interaction session with the camp leaders at Ghangria. 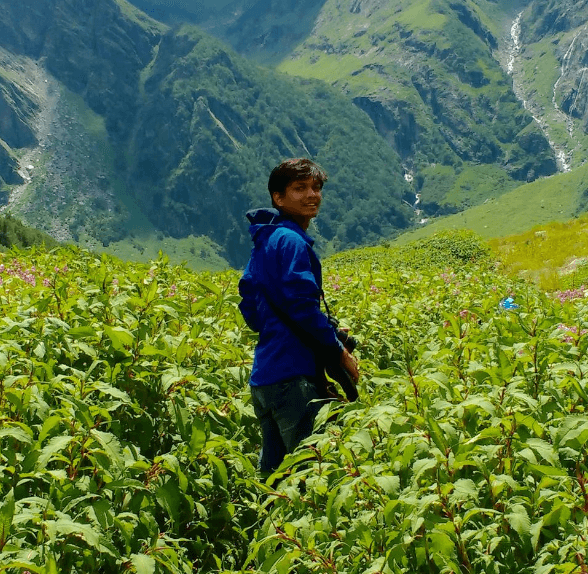 The only wise thing we did was hiring a guide, the biologist Yogita ‘Ben’, for our next day visit to the Valley of Flowers. Frank’s above lines from his book The Valley of Flowers - An Adventure in the Upper Himalaya sums up everything about life. One of the profound things most of us fail to realize while taking a trip is that positivity lies in one’s happiness, running away from inhibitions won’t help but learning to overcome them will definitely bring miracles. The best thing about walking in this valley is that you are bound to get distracted by the serendipity of the surroundings. You’d be admiring the Bhojpatra barks then suddenly realize that a bird is sitting next. I will never forget the quirky little tailless Himalayan rat we encountered while traveling back, look I got no tails just like you Hoomans and I can ramp walk just like you Hoomans. Gomesh was on fire with his puns and lame jokes. After a while, we lost track of the names of the flowers described by our guide and began to create our own. I doubt the wild Myosotis rightly called the forget-me-not can ever be unseen. Funny I declared to self that I would propose a girl then and there if she recognizes this flower and looks at it same way Angelina looks at the African kids. Also, beware that you might fall in love here or might not, warning both ways! I could just go on and on about this place…but I am writer blocked. Stop reading, simply go visit this place, silently, telling no one. I guess Bhyundar Valley suffers severe mood swings. One moment you will be happy stargazing and next you see sky covered in thick coat of grumpy clouds. We started our day with drizzling weather and most of our group members decided to go by pony uphill. 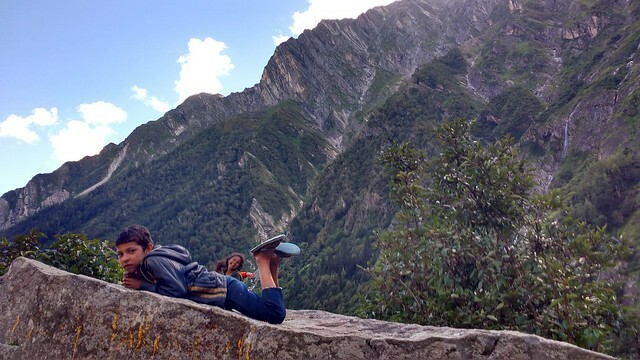 We were supposed to cover an elevation of about 1600m in about seven kilometers, too much. The whole mountain soon was covered in clouds and it began to downpour. Even the rain-cheater didn’t help after some time. For most of the hike, I was shivering due to cold, thanks to the tea stalls for serving me milk and Parle-G I was able to survive. I say it loudly, avoid the stairs to Hemkund Sahib, they are steep and dangerous. I was exhausted by the time I reached the Gurudwara. I prayed for a while but found myself too restless there. I decided to head towards the Laxman temple, its a teeny-tiny temple with imp versions of Ram, Sita and Laxman Ji. I knew this was my place. Thankfully Hemlata and Devosmita were also there and gave my shivering self a blanket. We were trying to warm ourselves when suddenly Rosefinch decided to pay us a visit inside. There is something in the air that makes the Himalayan inhabitants so fluffy, cute and adorable. It was as if Rosefinch came and took all our miseries and exertion away. There were no signs of rainfall halting anytime soon so we decided to descend. For some reason, it was amongst the favourite moments of my trek. maybe because of the conversation, maybe not, I don’t care much. We reached Ghangaria quite early and decided to visit our beloved Yogita at EDC (Eco Development Committee) office. I purchased some books related to the valley and a few postcards too. We explored the rest of Ghangaria village, stopped ‘Goatavita’ from grazing away all the Tulsi plants, boosted Hemlata - the queen of hideous jokes, to crack more of toilet jokes and also demotivated the incoming exhausted travelers coming from Govindghat about the distance still left. 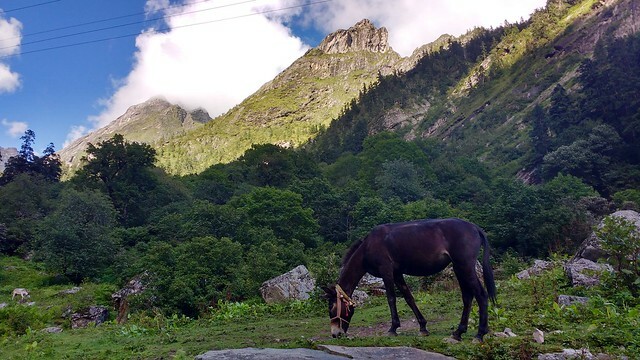 Enough of the mesmerising views of the dancing meadows, hymning flowers it was now time to leave Ghangaria and travel to Badrinath, where the supreme Lord Vishnu resides. 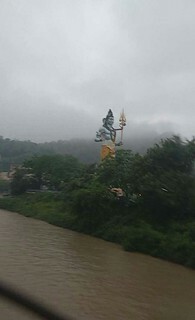 We travelled back again from Ghangaria to Govindghat. I had a Dumpty fall trying to watch Bagheera from Jungle book on TV near the Gurudwara. Journey to Badrinath from Govindghat was undoubtedly strenuous for the bus driver. 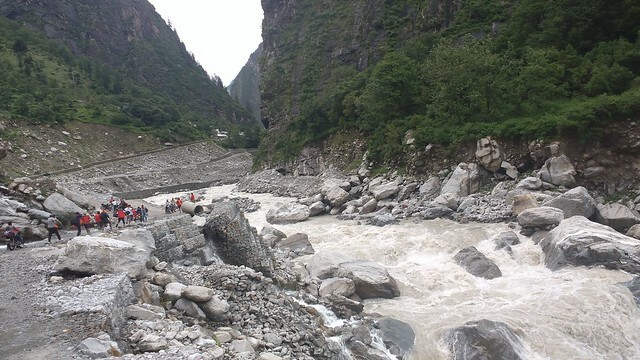 I saw some of the biggest rapids in Alaknanda river which could cringe anyone’s soul. Crossing numerous landslides and freshly built roads telling tales of devastation we somehow safely reached Badrinath. We had such a warm welcome there by the YHAI team. We visited the Badrinath temple and listened and sang the bhajans. Everyone was completely dissolved in the Aura of the place, we didn’t exist for those moments. At night we had a group Antakshari session. It was fun lip syncing Jhingat song, from Sairat movie. 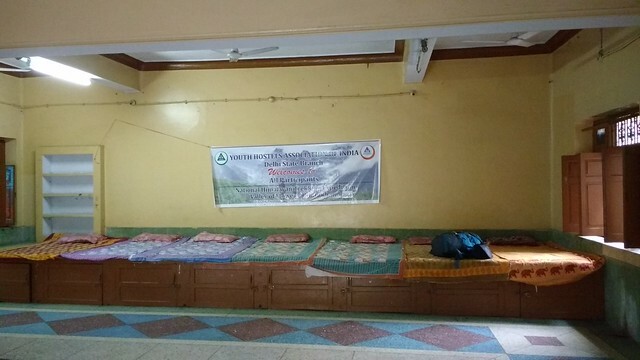 In our dormitory I didn’t let anyone sleep, we merged our beds and chatted all night long. Some crazy revealtions. Vidur declared Vijay sir as his Guru and Jayesh demonstrated his sword capababilities. The probability of someone dying by his hands was much greater than he making the correct move, everyone hid themselves with whatever they could grab. 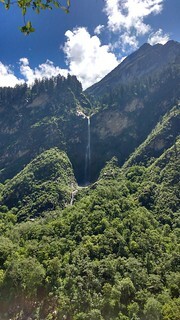 The trek would have been incomplete if we wouldn’t have seen the magnificent Vasudhara falls, Bheem pull, Ganesh Gufa and Vyas Gufa at Mana Village. Visiting the places described in ancient scriptures makes me wonder how epic saga they were, stiching tales to ones travel destinations. Read it somewhere that, if Harry Potter and Lord of the Rings could only survive the doomsday it would be fun watching ourselves fight over supremacy of Gandalf and Dumbledore. We just loved listening stories of Ram-Sita, Parvati-Ganesh-Shiv Ji from Reshmaben. She was quite a story teller and above all a learned person in herself. She is about my mom’s age and she and her husband are going to Everest Base Camp in March ‘17. 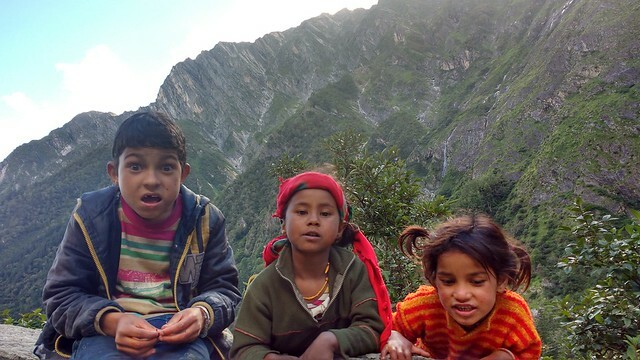 We returned from Vasudahara falls, had Rhodendendron juice and played with the local kids. One little girl told us that she wanted to show us something, eventually we saw a dead mouse lying there and these kids laughing at us. We had delicious home cooked momos too. Upon returning we visited the Badrinath temple again, this time we bathed together at the Tapt Kund, burnt and rejuvinated. 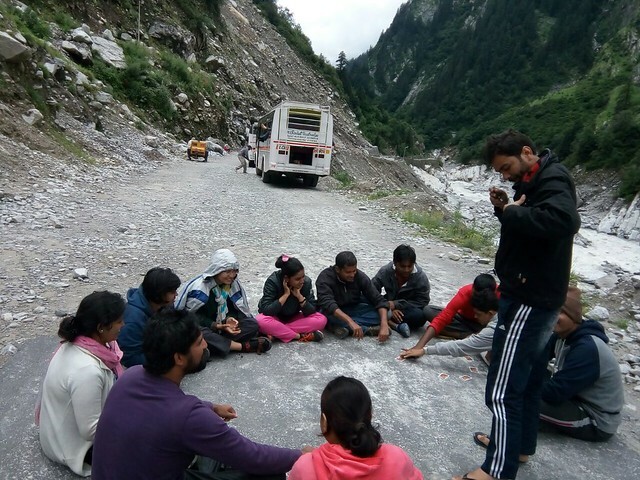 We were warned that next day is going to be difficult for us as there has occured lot of landslides between Badrinath and Govindghat. 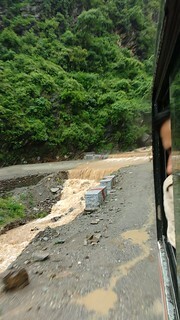 We left before six for our return journey and as expected we had to halt at multiple places because of the landslides. At Hanuman Chatti we almost stayed for two hours, stole apples, collected stamps from the post office and played with the police dog. Again stranded, this time everyone was busy playing cards as a huge bolder fell on the road ahead. So much positivity we had. The road cleared in few hours, as usual we couldn’t stop thanking the BRO guys. We did not even travel 15 mins and it began to downpour again and this time it was devastating. We stopped and about 100 meters ahead a major landslide happened washing away the complete road. Thankfully the YHAI team arranged another bus for us on the other side, but we were supposed to climb about three mountains and cross two water streams to reach the other side. It was indded difficult but we did it. I couldn’t believe that not for an instance anyone doubted Dharmesh Ji’s decision. Everyone safely reached the other side, but we were already delayed by almost Six hours and we couldn’t drive at night. So we halted in the lodge, Grand Hayat at Nandprayag fulfilling of of our Dubai to-do bucket list. We were hungry and were like starving Sudama waiting for a feast to happen. Roti and Paneer Butter maasala tasted heavenly. I can still laugh to the same extent recalling Gomesh’s hunger striken expressions. We didn’t have enough beds so I and Dharmesh ji decided to doze off in the bus itself. Everyone woke up at three in the morning and we had to hurry up so that we could reach on time. It was time for us to leave. 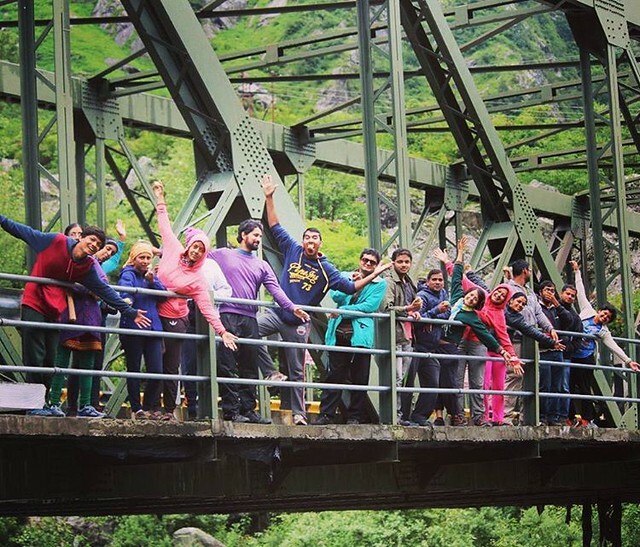 We all are already glued together by our love for the Himalayas. I never knew I was making friends for a lifetime. Stay connected, spread joy.